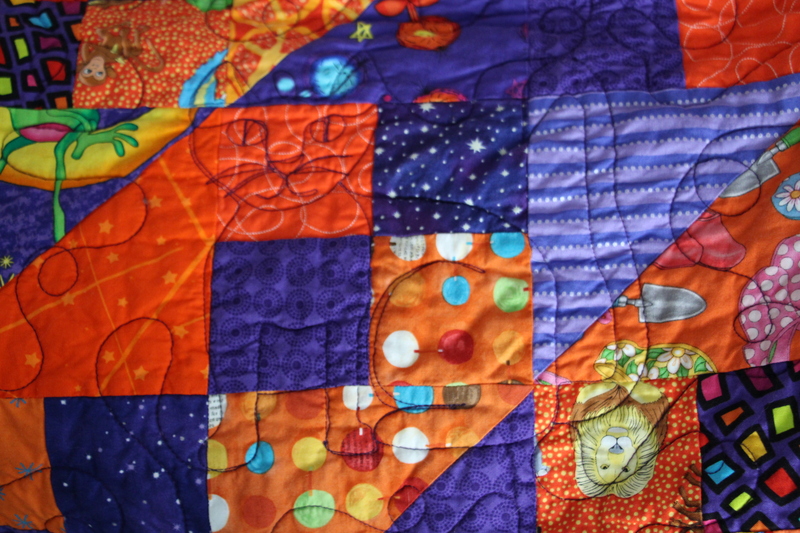 When I finished this extra colorful purple and orange quilt I was a little worried that it was just too much. I was surprised at how bold the colors were together and thought Oh Heavens to Betsy – What have I done?! So when my friend Sondra was getting ready to start the quilting, my only request to her was to see if she could tone it down somehow! Sondra is such an amazing quilter. Since the colors seemed very Halloween-ish, she decided to quilt in a few cats and a mouse. 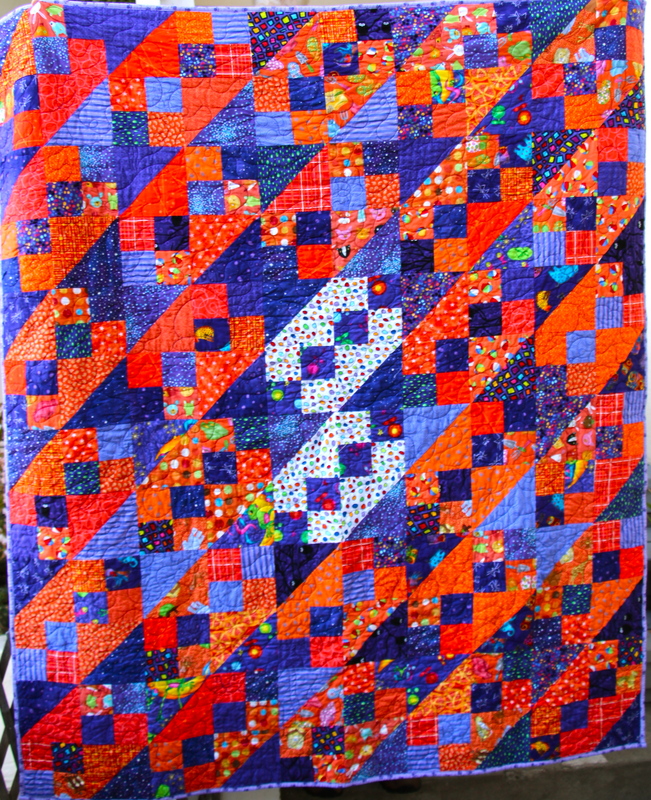 It really made the quilt lots of fun and while the quilt is quite purple and orange-y, it is now much better! And then my little photo-bomber! 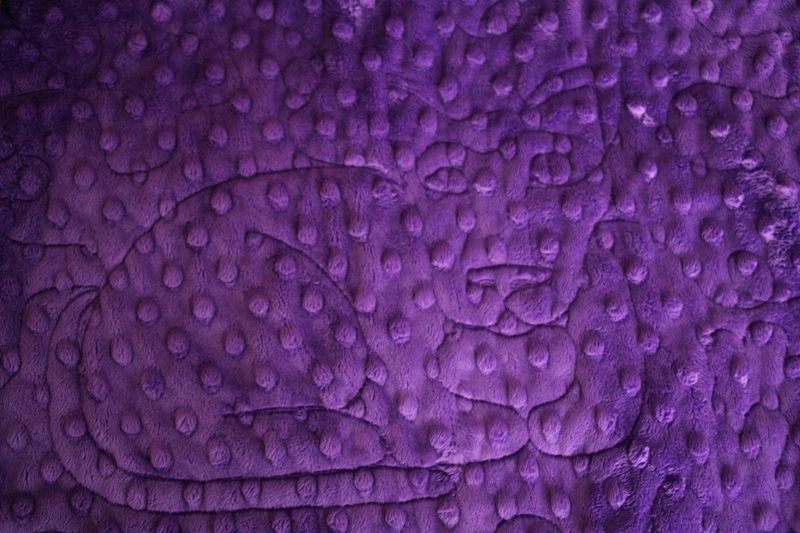 Another quilted kitty – much easier to see in person, but you can kind of get the gist of it. More detail of the front. The whole quilt after Sondra did the quilting. The idea and block pattern came from Camille Roskelley’s book and is the “Retro” block. Linking up with AmandaJean at Crazy Mom Quilts at http://crazymomquilts.blogspot.com/?wref=bif and with Sarah with Whoop Whoop Fridays at http://confessionsofafabricaddict.blogspot.com/?wref=bif and Link a Finish with Richard and Tanya Quilts at http://richardquilts.blogspot.com/ and TGIFF being hosted by Jessica at http://quiltyhabit.blogspot.ca/2014/01/tgiff-blizzard-finished-quilt.html Love these link-ups!! Thank you everyone! Great quilted cats. Love the dog too. Hi Heather! Thanks 🙂 I was just visiting your site and I love all your animals! Your Hedgehog army is fabulous! I can’t wait to see how you put those all together. I am currently very afraid of hexagons but I am seeing so many neat projects using them that I may just have to get brave. Hmmm…. What a fabulous finish! Love those cats! Hi Lorna – thanks! My friend Sondra can quilt the most amazing things! I am always in awe of what she does with my quilts! Always a fun surprise!! Enjoy your day 🙂 I am getting ready to sew some more blocks this morning. I do like the quilted cats. What a wonderful idea. Never too bright, busy or bold for me!! Hi Karen – thanks 🙂 My friend Sondra does such a great job with the quilting. 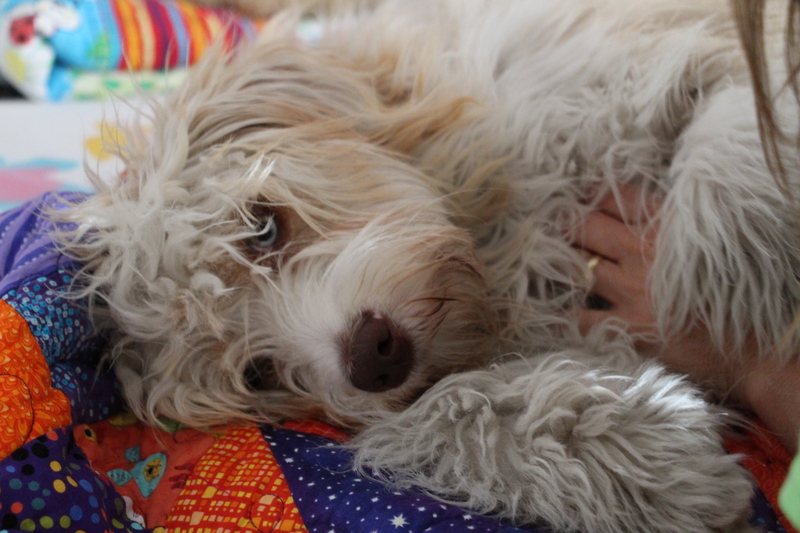 There are always a few surprises in each quilt – usually animals since that is my favorite thing! Have a great day. Oh wow! You quilted a cat! I’m impressed! Hi Shannon – I wish I could take credit for that fabulous cat! My friend Sondra does all of my quilting and she is really talented! She’s always got some hidden surprise in the quilting so it is extra fun to look at. I was just visiting your website. Your quilts are absolutely beautiful! I also love the Kate Spain fabrics – and the quilt you made with them is adorable! What a fun quilt to look at! 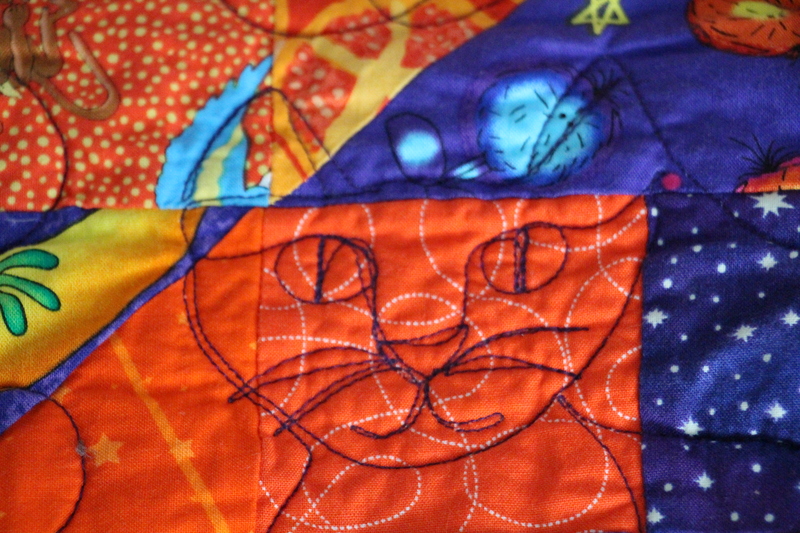 The quilting is so fun, I”ve never seen cats and mice like that! Hi Renee – thank you! My friend Sondra does all of my quilting and she is amazing! I was just visiting (and subscribing) to your website. Your quilts are stunning! WOW! I look forward to seeing many more! Wow, what a great way to liven up a retro block! I think the colors are awesome and your friend did a great job quilting the cats. Hi Diana – Sondra is so amazing with her quilting! She’s got this great imagination and just draws with her long arm quilt – I don’t think I could ever do anything like it!! oooooo…so nice! Those cats are so fun. Great fabric choices. Hi Vicki! Thanks! I absolutely love the pincushion/thread catcher thingy!! The fabrics are the best and I love how your project turned out!!! Very cute! I look forward to visiting your site again! Hi Vicki! Thanks! I was just visiting your website and I totally love your pincushion/thread catching thingy! The fabrics are really cute and I love how your project turned out! Super fun! I look forward to seeing more of your projects! Those cats are just amazing! Hi Michelle – thank you! Your super cute little applique mouse is amazing too! Love your choices of colors and pattern! Thank you Maja! I like the pillow you made from the Japanese fabric and denim. Very fun! ← Jungle Creatures Fabric – Can’t Get Enough of This Line!